Suunto clinometers can be used to measure heights of trees, towers, buildings, etc. 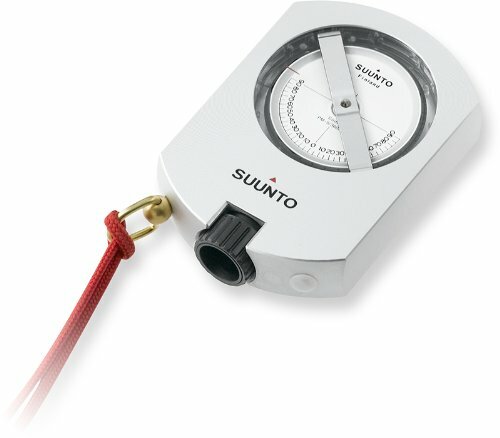 ; to measure slopes for grading or preliminary surveying; and to measure vertical angles for cellular and satellite installations and more.All Suunto clinometers feature a solid aluminum housing with jeweled bearing assembly. Damped scale for smooth, accurate readings. Parallax-free lens. 1/4" x 20 threaded tripod socket. Includes lanyard and black nylon case.Secant scale clinometers allow you to determine correct horizontal distances and compensate for slope when using the percent scale for height measurements. You can also eliminate prism rotation in point sampling.Since the secant scale clinometer expresses secant of a slope times 100, you should initially divide the clinometer reading by 100 to obtain the correct secant value. For example, a clinometer reading of 110 has a correct secant value of 1.10.?150% secant values x 100 - 100 to ?500. Percent/degree conversions on back.